Our country will always be a nation of the working class. Throughout history, the fate of the Philippines depend on the masa. Well, actually, the truth is the fate depends on who could muster and mobilize the working class. Spanish occupation. Our farmers and laborers said enough. An uprising of sticks and bolos ensued, we got our independence. EDSA. The working class said enough, and the most important road in the country filled with people. A dictator got ousted...peacefully. It is the working class who make a country move, a business run, a home built, make clothes to be worn. It is the working class who should be protected, loved and esteemed. It is in the working class that the survival of a family, the survival of the future generation depend on. If the country depends on them greatly then why are they rewarded poorly? Why OFWs say kung sa Pinas ako maghahanapbuhay, magugutom ang pamilya ko." There is something wrong. It has been wrong for a long time already. Generations of leaders have gone and passed, many still say they are poor. Although others say mayaman ako sa utang. May 1, Labor Day. In honor and celebration of the Manggagawang Pinoy, and then everyone else forgets almost immediately. A sad amnesia. 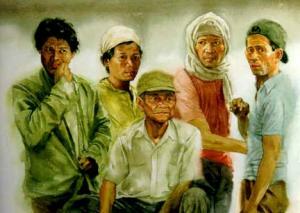 This is a tribute to the Filipino Workers, both here and abroad. Each is a warrior fighting for a living, for the survival of their families. Too bad, Labor Day of 2011 comes on a Sunday...no holiday.